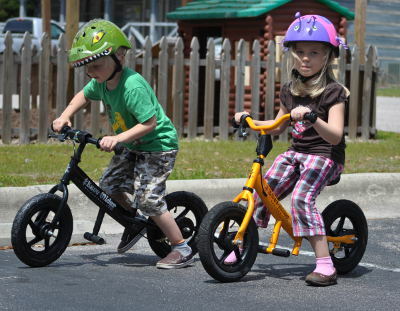 News :: Top 10 Reasons Balance Bikes are Better! - Glide Bikes - Balance Bikes for 18 months to 10 years old! Home/News/Top 10 Reasons Balance Bikes are Better! Date added: 09/06/2013 Top 10 Reasons Balance Bikes are Better! Balance bikes offer a safe and worry-free method for teaching your kids the joys of riding a bike! With your child being low enough to the ground to stand up and stop the bike before falling over, a balance bike will significantly reduce the chances of a scraped knee, or worse, a fear of bike riding! A balance bike is a better tool for learning how to ride than training wheels. Why? Because it allows kids to focus on balancing and steering, the scary parts of bike riding, while taking the fear out of the experience. By taking away the pedals, gears, and chains, balance bikes are also able to weigh much less than a traditional child’s bike. Weighing only 8-10 pounds your child won’t have any trouble keeping the bike up, or suddenly stopping. What is it about a balance bike that gives a child more control? With our Glide Bike you get our patented low speed downhill geometry of just 2mph. This guarantee should put your mind, and your child’s mind, at ease when gliding down even the steepest hills. The slow speed helps your child feel in control of how fast they’re going and empowers them to stop easily and without much resistance. When learning to ride a bike with training wheels there is a lot to keep in mind. Not only does your child need to worry about keeping themselves balanced when the training wheels come off, but there is steering, breaking, pedaling, and sometimes even gears! With a balance bike, the distractions are gone. All that your child needs to focus on is getting better at balancing, and how steering a bike works! Once your kid masters the art of balance they’ll be biking like a pro. Using training wheels requires a lot of adult intervention. Helping your kid feel safe when they’re far from the ground while teaching them how to keep from tipping over can be a daunting task. When your child is not dependent on you for balance and momentum they can progress at their own speed. With a balance bike your child can take the initiative to learn and develop their skills, giving them independence and confidence! When creating a foundation for future childhood memories you want the milestone of riding a bike to stick out as fun! Training wheels can make the experience of being outdoors and biking one that isn’t enjoyable. This can all be avoided with a balance bike, swapping the time consuming training sessions with Mom and Dad for the joy of being outdoors and learning something new. We know that learning and training can be stressful! From tying shoelaces to reading and math, when expectations aren’t met both sides get frustrated at how slowly things are going. Using a balance bike as a training tool for a skill that can be difficult to master really helps keep the peace and allows both parties to see improvements more quickly. While typically it can take months of practice with the use of training wheels before kids can confidently ride a bike, parents have been experiencing success in a matter of weeks through the use of balance bikes. Balance bikes allow kids to immediately enjoy practicing their balance and the payoff is quicker! If you are looking for a bike that not only allows for a smooth training experience, but one that will be reliable and last, then our Glide Bikes are for you. All of our Glide Bikes come with a lifetime warranty, ensuring that your child will have a high quality product for years and years. Possibly the most important reason why we think the balance bike is better is because it’s more fun! If you take away all the training, safety, and logistical benefits, you’re left with the simplicity of your child enjoying the outdoors and being in control of their fitness and physical education. Having your child immediately be able to enjoy the experience of riding a bike, without the time it takes to get through the training wheel phase, is the best reason to go with a balance bike!